Cider makers have reacted angrily to a parliamentary motion suggesting a 29p tax raise on a pint of the traditional West Country tipple. Labour MP for Mansfield Alan Meale proposed increasing the duty on cider to bring it in line with beer. 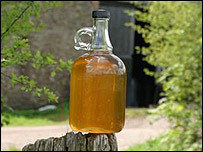 But the National Association of Cider Makers (NACM) spokesman Simon Russell said the plan put jobs at risk. He said duty was less on cider for a number of reasons including the "much greater cost of production". Mr Russell said: "We would be delighted to meet with Alan Meale MP, to explain why... cider and beer are rated for duty as they are. "The reasons include the much greater cost of production for cider over the equivalent volume of beer, and the very significant investment in the rural economy as a result of the planting of many millions of trees in the last decade. "All this plus jobs will be at risk if Mr Meale were to succeed." The West Country and Herefordshire produces 85% of the UK's cider, say NACM. Louisa Sheppy of Somerset-based Sheppy's Cider Ltd said: "The proposal contained in the Early Day Motion represents a very serious threat indeed to the future of independent artisan cider-makers. "If cider becomes the expensive alternative to beer as a result of duty changes, then this successful British industry could very rapidly decline." The Early Day Motion reads: "That this House notes that duty paid on a pint of 5% alcohol cider is 29p less than is paid on a beer of equivalent strength. It "further notes that the UK Treasury could raise £400m annually in additional revenue if cider duty were brought into line with beer duty". The EDM also notes 90% of UK cider is produced by three multinational companies and calls for government support for smaller manufacturers.